Toddler - $60.99 Only 4 left! Small - $60.99 Only 5 left! Medium - $60.99 Only 8 left! Scooby Dooby Doo, where are you? We got some work to do now. You tell you kid to hurry up. You've got some stuff to do now. But you still can't find him. He is hiding, because he doesn’t want to go to the dentist, and he really doesn't want to go shopping. He wants to hang out at home watching TV. He would rather stay home, and watch Scooby Doo! He loves the scardy-cat Great Dane. He loves the way Scooby shouts "Rooby Rooby Roo" at the end of each episode. He even imitates the dog quite well. He goes around the house looking for clues about who the spooky Witch Doctor is, and he tries to "unmask" people when they have hats on, and sometimes even when they don't. Have your little guy jump into this Child Deluxe Scooby Doo Costume anytime you try to get him to do something. Tell him that Scooby wouldn't be afraid to get his teeth cleaned at the dentist (well he might be afraid, but don’t tell your kid that). Or too busy watching cartoons to go to the store with mom. 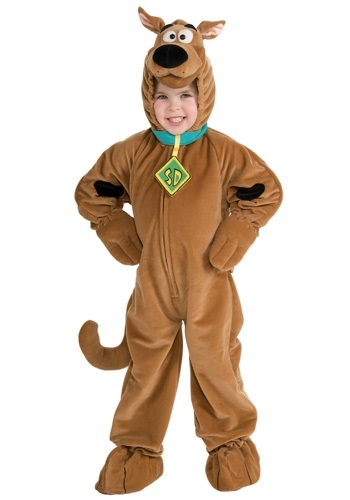 He will be excited to show off his awesome Scooby costume to the receptionist, and he will point out his awesome blue collar, and SD tag to the clerk when you are checking out at the store. And he will be sure to yell "Rooby Rooby Roo!" as you leave.